By Marie Finnegan of K-9 Solutions Dog Training Inc.
I’m not sure why some people have a hard time thinking of dogs as individuals. We lump dogs into the breed box they fill and expect them to act like the books say they will. I think we need to be careful of how much we try to fit our dogs into that specific size box. Mainly because I think it is unfair to many of those dogs. What could we be denying them by expecting A, B, C, and the dog in front of us is really B, C and D, or even D, E, and F? We don’t really know if we don’t give them a chance. Make no mistake; I am just as guilty of it at times. You say Border Collie to me, and I immediately think high energy with a propensity to herd things. You say Beagle and I think, a dog that follows its nose. Those are traits that those breeds are known for. However, I have met Border Collies that were couch potatoes and Beagles that didn’t seem any more interested in following a scent than any other dog. What we need to remember is that breed traits are a possibility of what the dog may be like, but it isn’t a guarantee. As a dog trainer I have had over 10 years of meeting many dogs and watching their behaviors. What I have seen over that time has convinced me that we aren’t giving some of our dogs a fair shake when it comes to judging them on their own merits. Dogs have a hard enough time on this planet being misunderstood due to a communication gap between our species. There are many examples of that out there. Do we really want to add to their challenge of living with us? A dog trainer in my area told that last one to me at the time when I showed him my new puppy. I was a first-time dog owner (as an adult), so you can imagine what this did for me. Thankfully, I decided to be optimistically cautious and raised that dog with cats, kept him through the birth of my children (who are both still alive and unscarred) and added new dogs to the home after he was an adult. Looking back he probably was even more social than I gave him credit for, but I was super cautious and didn’t let him have a chance to interact much with other dogs out of fear from those first planted seeds. Compared to the dogs I have now he led a very sheltered life, and I regret that for him. Aside from all the dogs I have worked with over the years, I have some experience with my own dogs being individuals too. I have a Pug that I have done tracking with. It wasn’t something I decided to try on a whim. She air scented on a watch that had been left behind in my yard by one of my children’s friends. I was surprised when it happened. Pugs weren’t supposed to be able to breathe correctly, let alone do scent work! I had done tracking with some of my other dogs, so I decided to give it a go with her. She is very good (and held back only by her lazy handler)! If I had listened to popular opinion on the breed I never would have even attempted such an activity with her. 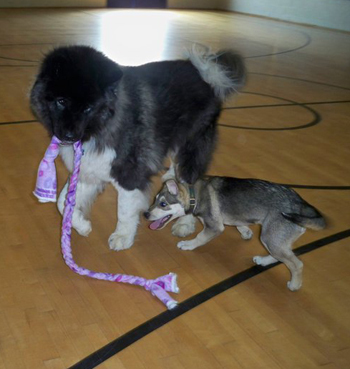 I also have an Akita that helps me socialize dogs in my prison program and test other dogs when needed. I decided when he was young to socialize him really well with other dogs to see if that would make a difference with the potential for aggression towards other dogs’ trait. He is now 7 years old and does well with many other dogs (with the right introductions, of course). Again, if I had listened to the breed experts, what would he have been denied? We need to stop underestimating our dogs as individuals. 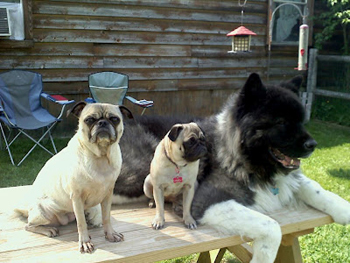 Are there Pugs out there that can’t breathe and do tracking? Absolutely. Are there Akitas out there who aren’t good with all other dogs? Absolutely. In the same vein there are Golden Retrievers that are also not good with other dogs and Chow Chows that are big pussycats. (My hand to God, I have met those dogs.) That door swings both ways. But how many of them aren’t given the opportunity to be who they really are? Does this mean we need to throw what we know about breed traits out the window? Of course, not. Knowing the traits of a breed can still give us an idea of what the blueprint might be. Unlike a blueprint for a building, however, we need to remember that the dog is a living being that is a product of many things including environment, training, brain chemistry and genetics. They are all parts of the puzzle. But it is still a puzzle. The pieces go in the way they fit, not the way we sometimes want them to go. Train and love the dog you have behaviorally in front of you, not what the dog might be according to some book. The dogs aren’t reading those books, after all. I find the personality differences in my two pits so interesting! So different, both raised from about 4 months old in the same household, yet still sharing some of the traits, silly-sweetness, of others whose stories are told here on StubbyDog. Great article! Thanks for sharing your perspective! adoremydogs So true, dogs are all individuals, and we must remember that. Thanks. Great read & so true! We have an English Bulldog that looks like.he could be mean, but in fact is a love bug . Yet, my beloved Sheltie who was great with people constantly insisted on asserting himself as CEO of.the house. He was my teeny tiny tyrant! Got get.to know your furry family members not just their breed. Sheiv001 You said, got to get to know them as individuals. Thanks for sharing. Great article! I’m also guilty of that in the past. When I was with a White German Shepherd Dog rescue. I was sure at first that all WGSD’s were the same: good with their inner circle, cautious of all strangers and reserved. Man, was I wrong! The WGSD I raised was friendly with people, high energy, and even became a therapy dog! Matt.S It’s so easy to judge, but then again, it’s so easy for a dog to change all your perceptions about that breed. Thanks for sharing Matt! Thank you, Marie Finnegan. Your blog has joined my Favorites. I’m not a trainer, but am a 2-dog mom to pit mixes (a female and a male) and am thankful that everything I read on your blog matches exactly what my trainer and veterinarian(s) tell me about all dogs and bully breeds, in particular–they are awesome with a responsible owner. In fact, one of my vets (we also have 3 cats) rescued a stray, beat up pit bull that someone brought to the vet clinic that she thinks had probably been fought. She said he tried to tangle with her dogs for about the first week and when he realized there was nothing worth tangling about, he became one of her most laid back dogs who was happy to finally have a good home. 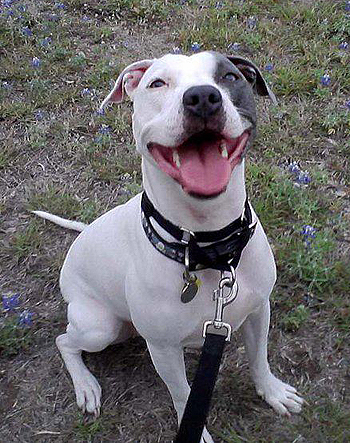 pitbullsrock Wow, we love it, thanks for sharing your experiences.